Enterprise transformation is a dynamic process aimed at radically simplifying enterprise structure, streamlining an reducing information flows, and assigning proper responsibilities to modern enterprise technologies, including artificial intelligence. The first phase—social transformation—partitions the enterprise into a network of composite agents (units) capable of effectively and efficiently processing enterprise information, thus eliminating individual agents from the enterprise level. The second phase—systemic transformation—creates formal contracts between units and the environment by establishing formal unit boundaries. The boundaries encapsulate people, process, data, and technology within units, thus hiding the complexity of their inner workings. The third phase—technology transformation—implements expectation based coordination and event driven communication to enable flexible work interactions between units at the enterprise level. During the final phase—unit transformation—enterprise units reengineer themselves at their own pace and rhythm, and in their own chosen direction. All social systems, and thus all living systems, create, maintain, and degrade their own boundaries. These boundaries do not separate but intimately connect the system with its environment. They do not have to be just physical or topological, but are primarily functional, behavioral, and communicational. They are not "perimeters" but functional constitutive components of a given system. Enterprise units of today mostly operate in internal environments that have no boundaries. While the benefits of not creating unit boundaries are obvious—cost/time savings, resource sharing, and enhanced cooperation, the negative effects are less visible, but more severe and longer lasting. Those include (1) tight coupling, high interdependence, and the inability to adapt to change; (2) low transparency and accountability; (3) the lack of ownership and control over resources; and (4) a significantly higher volume of information flow. The enterprise engineering framework (EEF) considers systemic transformation—the formalization of units' boundaries—the second most important phase of enterprise transformation. The EEF focuses on the creation of digital boundaries, which play a similar role to that of physical boundaries, but are differently constructed. The absence of physical boundary elements around a social system means no protection and unrestricted interactions with the environment. In contrast, the absence of digital boundary elements creates a non-permeable digital boundary, which means the ultimate protection, but the inability to interact. The purpose of the boundary which surrounds a center is two-fold. First, it focuses attention on the center and thus helps to produce the center. It does this by forming the field of force which creates and intensifies the center which is bounded. Second, it unites the center which is being bounded with the world beyond the boundary. For this to happen, the boundary must at the same time be distinct from the center being bounded, must keep this center distinct and separate from the world beyond it, and yet also have the capacity of uniting that center with the world beyond the boundary. Then the boundary both unites and separates. In both ways, the center that is bounded becomes more intense. Boundaries do the complex work of surrounding, enclosing, separating, and connecting in various different geometric ways, but one vital feature is necessary in order to make the boundary work in any of these ways: the boundary needs to be of the same order of magnitude as the center which is being bounded. If the boundary is very much smaller than the thing being bounded, it can't do much to hold in or form the center. A two-inch border cannot hold a three-foot field. In a room, the boundary between floor and wall needs more than a six-inch molding - a wainscoting, 30 inches high, is more in scale with both. An effective boundary for the river Seine consists of roads, walls, paths, quays, trees, something almost as massive as the river itself. In general it is necessary to think of boundaries as very large. Represent a formal contract between the unit and the environment. The contract structures and enables effective and efficient interactions between the unit and the environment (customers and other units) by defining not only communication protocols, channels, message formats, but also service level agreements. Hide the complexity of the unit's data and inner workings. This—along with the standardized contract—minimizes the number and the complexity of the interactions between units that are required to achieve a common goal. The substantial reduction of volume and variety of the enterprise information flow liberates much needed resources for more productive use. Protect the unit from negative effects of the environment. Properly constructed boundaries (1) prevent loss, theft, intrusion, and unauthorized access and use; (2) protect the privacy and ensure authenticity of data and information; and (3) filter the incoming information flow. Protect the environment from negative effects of the unit. Loose coupling reduces interdependencies between enterprise units and increases their ability to evolve and adapt to change. Increase transparency and accountability of the unit. 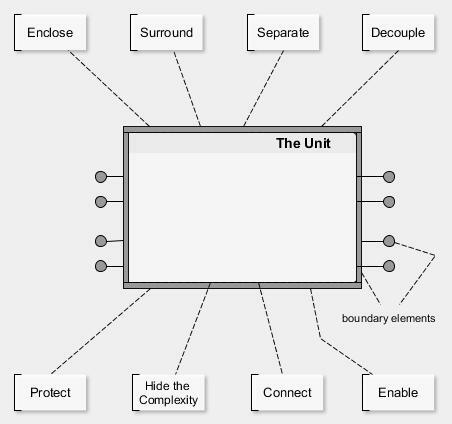 Formal digital boundaries provide much needed visibility into the holistic view of the runtime behavior of the unit. 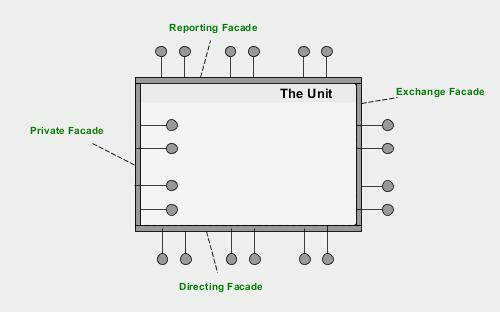 The recording, reporting, and visualization of the unit's interactions makes it open and transparent on how well it meets its responsibilities. It takes courage, power, and will to challenge the status quo, to overcome the obsession with with efficiency over effectiveness, and bring about meaningful change. Amazon CEO Jeff Bezos demonstrated unprecedented leadership and drive when taking a radical approach to systemic (boundary) transformation, which was described in the post that was intended to be shared privately, but was accidentally made public. The success of systemic transformation will be determined by a decision of main stakeholders whether or not to invest in the development of internal boundaries. This is the situation when one must choose between efficiency and effectiveness...and the former has an unfair advantage. 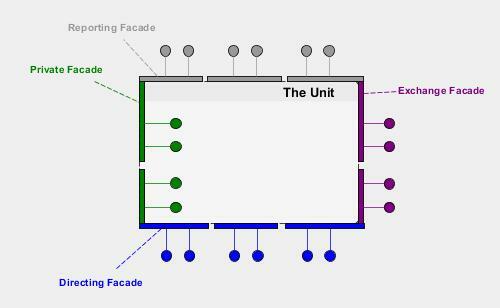 A unit's boundary is constructed as a collection of facades, where each facade serves a particular environment segment (customer category). Directing and reporting facades support hierarchical relations between an executive unit and the units under its authority. Exchange (customer facing) facades support transactional relations between the unit and external customers. Private (employee facing) facades support members of the unit. Regulatory facades support enterprise communication with regulatory bodies, such as revenue, compliance, and other authorities. Collaboration facades enable cooperation and collaboration between enterprise units. A facade is organized as a collection of interfaces that could be implemented as web applications and mobile apps, web services and microservices, and FTP and JMS interfaces, among others.